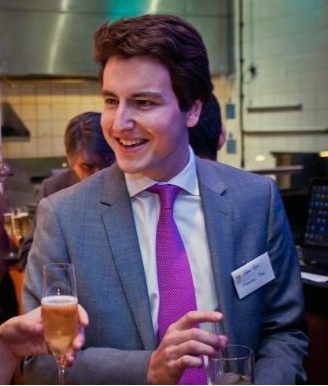 In the week of the Autumn Statement (AS), Adam Palin took a look at sin duties. 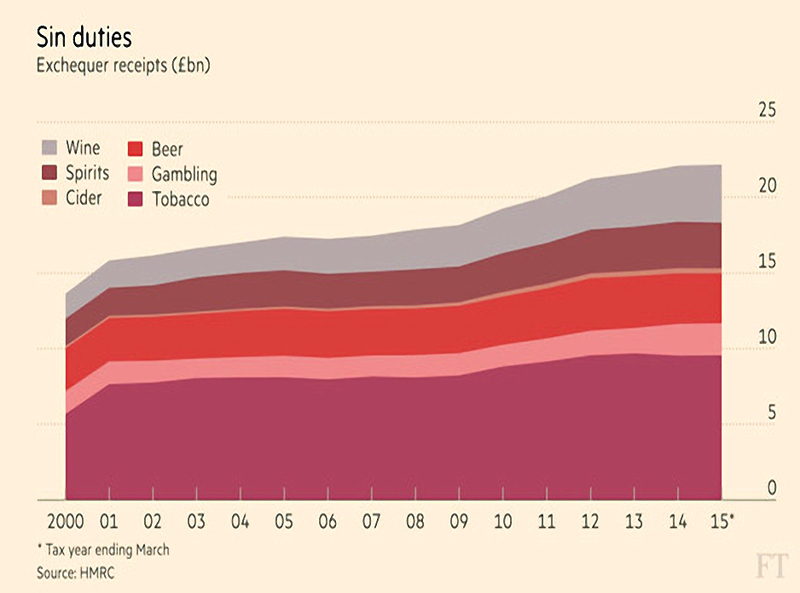 He broke down the tax contributions from the nation’s drinkers, gamblers and smokers over the past 15 years. Total taxes over the period were almost £300bn, excluding VAT. Last year’s figure was £22.1bn, up more than 60% from 1999-2000. And this is despite the fact that people are smoking and drinking less. Smokers fell from 28% of the population in 1998 to 19% in 2013m and alcohol consumption in 2014 was 7% below 1999 levels. The duties themselves have of course been going up. 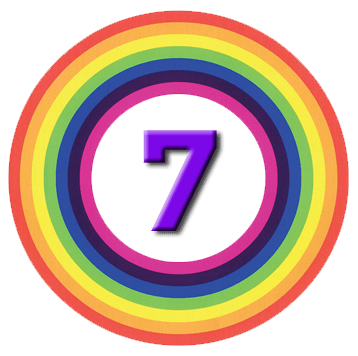 Tobacco is the biggest money spinner, with only Ireland within the EU having more expensive fags – a pack of 20 in the UK costs £7.98, including £6.17 of tax. Beer has got off lightly – duty is up 41% compared to 39% inflation – but spirits and in particular wine (which has grown in popularity) have been hit harder. Gambling duties have been relatively flat. Most money is raised from the lottery, but the growth in gambling machines (mostly in bookies shops) has also contributed. Between them, these five should raise £28bn over the next five years. Merryn also discussed the impact of the stamp duty surcharge on buy-to-let (BTL). The key point is that this extra £6K is cash upfront. Since BTL lenders usually require a 40% deposit, a £200K house needs £81.5K to cover the deposit plus the stamp. Next April, £81.5K becomes £74K after stamp duty, which can only serve as the deposit on a house worth £185K. In theory, the 2.5 times gearing in BTL means that a 3% duty increase could depress prices by 7.5%. Personally, this is a silver lining – perhaps I will be able to buy a cottage in Cornwall after all. Or perhaps holiday homes won’t be affected in this way – only time will tell. more than 1M more construction workers would be needed to build 300K homes a year – but presumably some of these could be imported? The one housing change they liked was a commitment to planning reform, but even here the devil is in the (so far unannounced) detail. The Economist’s other three articles on the Autumn Statement (1, 2 and 3) were about shaping the British state. Although the U-turns in the AS (tax credits, police cuts) made the headlines, the reshaping is more important. Inheriting a deficit of 11.1% of GDP in 2010, Osborne aims to reach 2020 with a surplus. 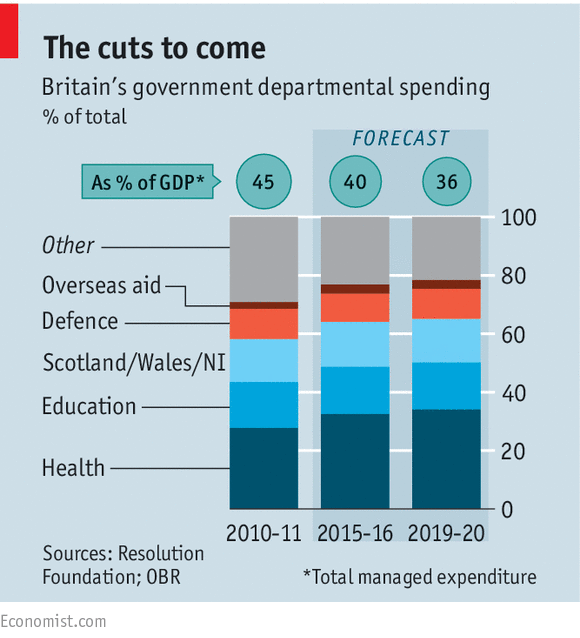 Spending will fall from 45% of GDP in 2010 to 36% in 2020. Actual spending in inflation-adjusted cash will be only 1% lower than in 2010. As an aside, at the Gold, Bears and Traders show on Saturday, I saw a presentation from Mark Littlewood, DG of the Institute of Economic Affairs. Mark was in favour of Hong Kong-style low taxes and low government spending, to improve prosperity. One of his slides2 showed the tax take against government spending for the last 50 years. Mark suggested that 37% of GDP was the maximum size of state that we can support. So Osborne’s 10-year “austerity” programme is merely returning us to where we should have been all along. The other major change to the state is the devolution of fiscal and spending power away from Westminster. In practice the cuts will be tougher than they seem, mainly due to demographic pressures on schools and the NHS. Government departments have been cut so far without much impact to services of public satisfaction. The next stage will be a lot more outsourcing. 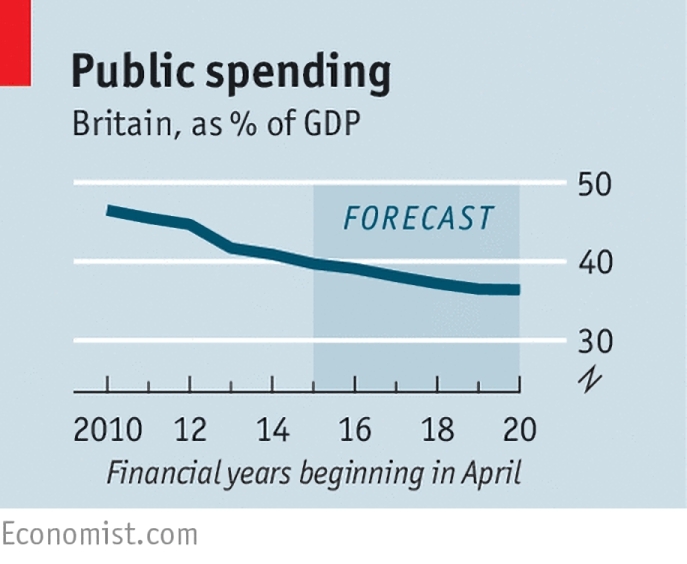 The Economist would like the surplus target to exclude capital spending on infrastructure. I can see the benefit of that in the short-term, (a boost to productivity) but the books have to balance eventually, and from Osborne’s perspective, just before the 2020 general election would be the perfect time. They would also like the ring-fences around health, eduction, defence and foreign aid to be removed, to avoid distortions like the justice department charging criminals to use the courts. They are also opposed to the triple lock on the state pension. I am not, because the pension remains well below the minimum wage and the benefits cap. He wants to reduce government’s role and move from the subsidy state to the enabling state. Osborne the PM would try to forge “a benign environment for individuals, firms and municipalities” but be “less willing to meddle in how they proceed – or to catch them when they fall”. 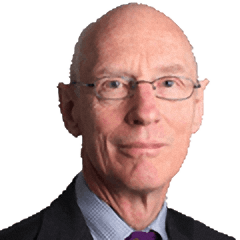 Back in the FT, Ken Fisher wanted to debunk a myth about the impact of currency strength on growth, imports and exports, and stock markets. The general understanding is that a strong currency will hurt exports, company earnings and hence the stock market. But Ken can’t find the evidence. for example, the yen’s plunge since 2012 hasn’t led to soaring exports and rapid growth for Japan. In fact, he can’t seen any relationship between long-term exchange rates and international trade. The big driver of the recent falls in UK (and US) earnings is the collapse in commodity prices. Non-commodity firms are doing well. Ken expects positive surprises to push stocks higher over the next over the next 12 to 18 months. 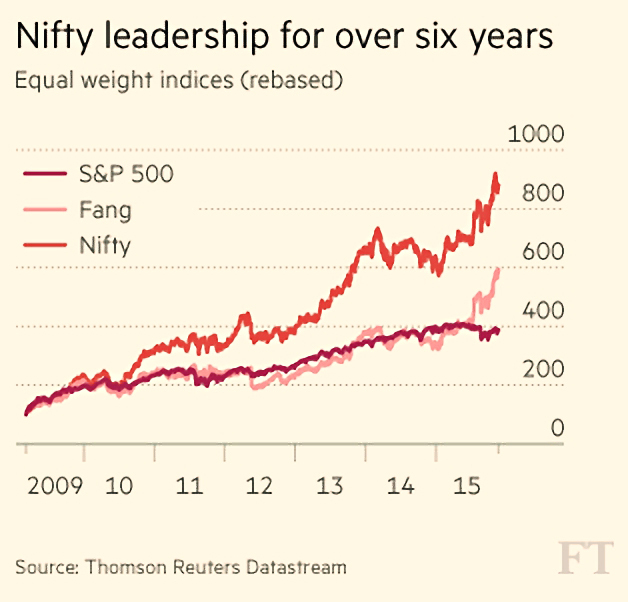 John Authers looked at how a handful of large stocks dominate the US bull market. 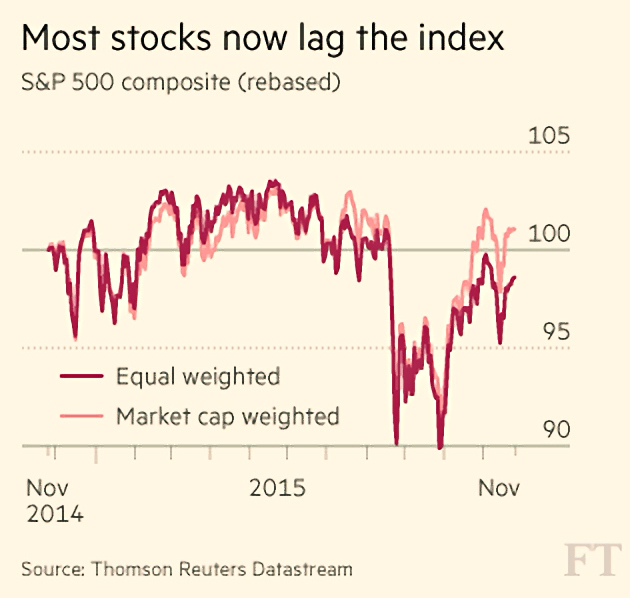 The US bull is into its seventh year, but it is growing much narrower. Initially it was dominated by small companies, but now a handful of stocks are driving the market. Each of these groups is up 60% in 2015, while the S&P 500 is up about 1%. 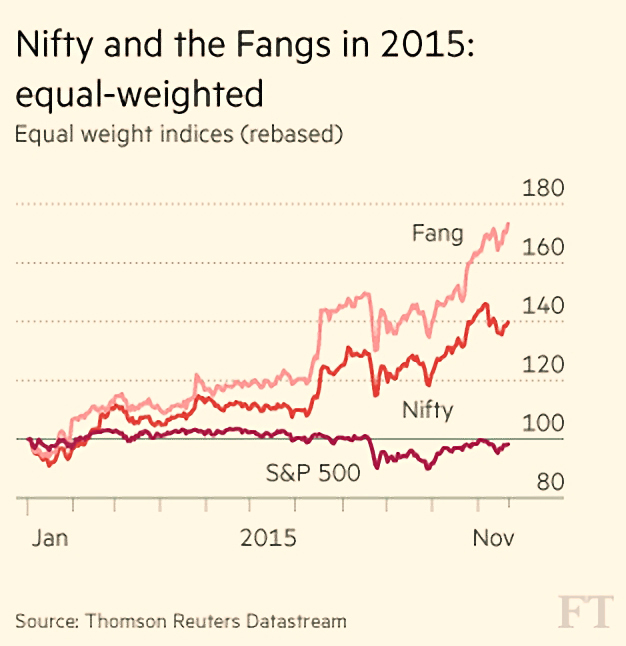 The equal-weighted S&P 500 is down in 2015 – most stocks are down. 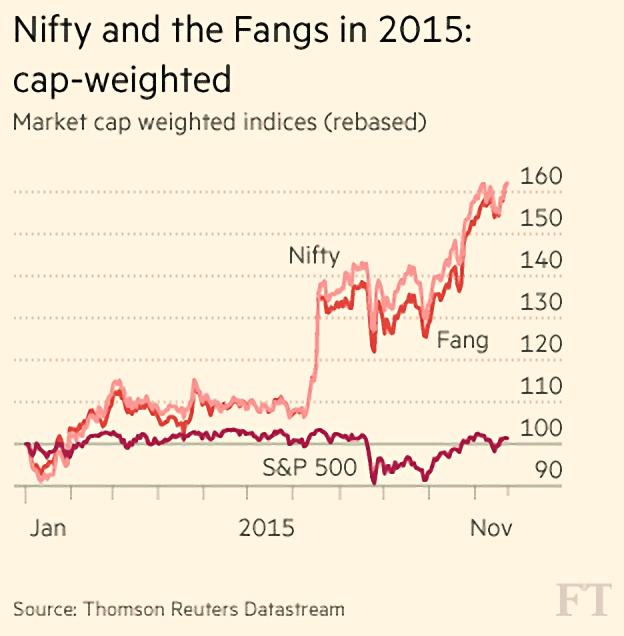 There are echoes here of the “Nifty Fifty” of the early 1970s, or the dot-com boom. John points out that this makes things hard for US fund managers. The only way to beat the market is to over-weight a few large stocks that already look overvalued – this is a hard strategy to justify. Here in the UK, large stocks have under-performed, due to the large weighting to energy and resources companies. To outperform, just avoid these sectors and over-weight smaller companies. 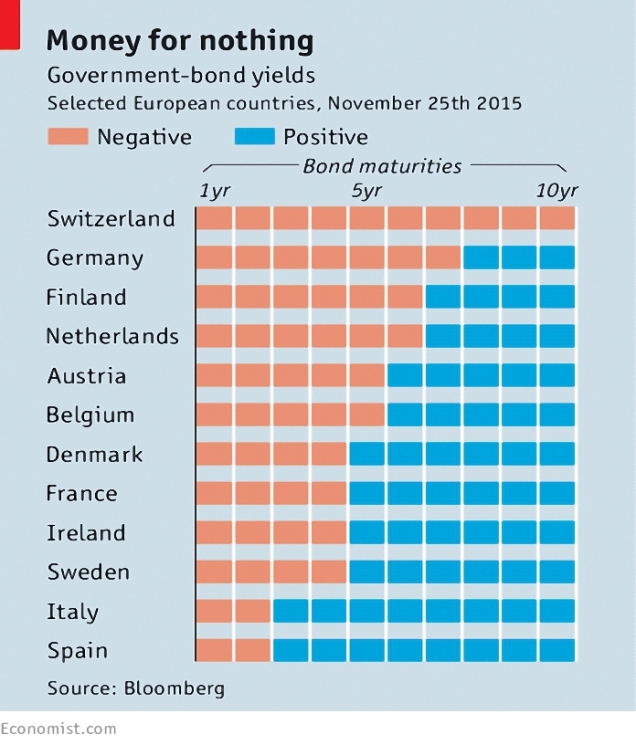 The Economist revisited negative interest rates. The ECB’s deposit rate – which it pays to banks on their reserves – went negative in June 2014, and hit -0.2% three months later. The December 3rd meeting of its rate-setting board is expected to cut again (and announce more QE). Until recently, zero was thought to be the lowest possible interest rate. Below that, the rational choice is to hold cash (under the mattress if necessary). But central banks appear committed to testing the lower bound. For most of the active players (other than the ECB – Denmark, Switzerland and Sweden), the goal is to suppress their currency against the euro. So they need interest rates even lower than the ECB. Retail customers have been shielded to date, which dents banking profits. There have also been calls to abolish cash, which would make it harder for retail investors to escape negative rates, and might also shrink the black economy. Gift vouchers and pre-paid cards and passes could have the same impact on a smaller scale. Eventually, companies would make payments quickly and try to receive them slowly. They would grow their inventories. We haven’t got there yet, but it remains the direction of travel. Buttonwood looked at the failures of Lehman’s and HBOS in 2008 – there’s a new book out on the former and a recent report on the latter. Alan Greenspan, the former Fed chairman famously admitted that he didn’t understand why bankers would take risks that would destroy their own businesses. By taking on more risk as competitors retreated, both grew market share, aiming for long-term success. Risk control systems then failed. Lehman’s risk department had almost 400 staff, but was over-ruled. HBOS’s stress tests used a hypothetical mild downturn. Both became heavily dependent on short-term wholesale funding, and hence reliant on investor confidence. This is probably why distressed assets were not written down quickly. Both boards lacked recent experience of banking. Lehman also controlled more than 7,000 legal entities – of which 209 were subsidiaries – and had assets of $700 billion. And finally, a long period of benign economic conditions led to over-confidence. Their bosses believed that if they didn’t keep growing, they would be replaced. And finally, Schumpter took a look at whether disruption has itself been disrupted. 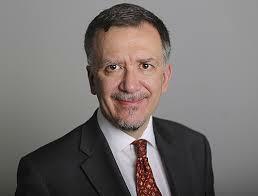 Clay Christensen of Harvard Business School came up with the concept 20 years ago. 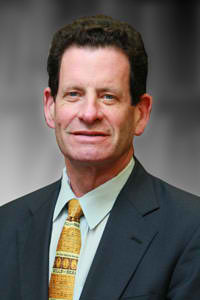 He is now is regularly named as the world’s most influential management guru. The Economist is worried that by sticking to his version of disruption, other forms will be missed. So Christensen believes that disruptors are newcomers, and attack the low end first. Apple disrupts by inventing new categories of product above the existing ones. Google threatens carmakers, Facebook attacks newspapers and Apple is after TV stations. 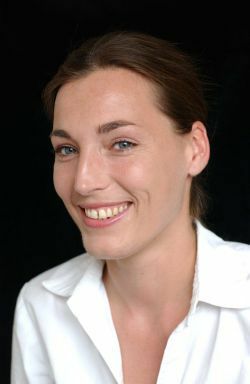 Individuals who cannot master their emotions are ill-suited to profit from the investment process.